The Australian Terrier temperament is spirited, even-tempered, and courageous. It was Australia's first show dog. However, the Australian Terriers weren’t only bred for show. This little Terrier – the smallest of the group – killed snakes and rodents; served as a watchdog, and tended sheep. They were developed from the rough-coated Terrier but also crossed with various other Terriers. The Australian Terrier dog is famous for their upbeat personality and joy for life. They are also extremely adaptable and lively. In true terrier fashion, Australian Terriers are alert and love to bark at anything they deem “suspicious”. They make a great watchdog but don’t count on them to be great guard dogs solely based on their size. Thanks to their history as natural hunters, Australian Terriers love to chase anything that catches their eye: squirrels, cats, rabbits, etc. They have a strong prey drive, so be sure to always keep them on a leash or secure in a fenced yard. Like all terriers, Australian Terriers love to dig. If you’re a big fan of your lawn, they may not be the right breed for you. Left unattended for too long, the lawn will become his own personal entertainment. If you have a naughty digging Australian Terrier read this to find out how to stop digging. Australian Terriers are loyal and very family oriented. They tend to gravitate towards the elderly and young children. However, they should always be supervised with small children. They are not aggressive or snappy, but they don’t enjoy too much rough-housing. Because they are so attached to their humans, they tend to match the mood with yours. If you are happy, they’ll be playful and lively. If you’re sad, they’ll be calm and quiet. Australian Terriers mischievous and spirited personality is all fun and games until it comes time to training. Establish a leadership role from the start and your training endeavors will be successful. A firm, yet consistent approach is necessary and it does help that the Australian Terrier are extremely intelligent. Repetitive training won’t work on Australian Terriers so keep training lessons fun yet challenging. Positive reinforcement and reward-based training is the way to go. Australian Terrier puppies benefit from puppy training and obedience classes with treats, praise, and toys. Sometimes even with the best training, they don’t like to share. So be careful with two males in a household. If you are up for the challenge of training your Australian Terrier then check out these FREE Dog Training Videos. Ready to add an Australian Terrier to your family? To find the perfect Australian Terrier dog for your family, first, consider your lifestyle. If you are an active family with enough time on your hands, an Australian Terrier puppy would be perfect for you. But, if you don’t have the time or resources to raise a puppy, an adult Australian Terrier might be the better option. The Australian Terrier Club of America is a great resource for finding information on Australian Terriers from breeders or from a rescue. Another awesome resource is Temora Australian Terriers, a breeder and rescue coordinator located in the Midwest. They have been breeding and raising Australian Terriers since 1995. The average cost of Australian Terrier puppies for sale is between $1000-$1500. 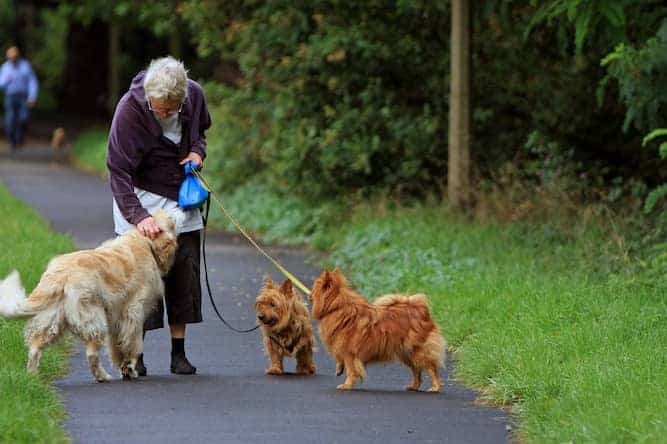 The Australian Terrier price depends on litter availability, location, and lineage. If you’re looking for Australian Terriers for sale with a champion bloodline, expect to pay closer to $1500. Decided to go the Australian Terrier rescue route? A great place to start is the Australian Terrier Rescue website. They have Australian Terriers available for rescue as well as success stories. Australian Terriers for adoption are great for families who are looking for an adult dog or for one who is already house-trained, and obedience trained. If you are looking for an Australian Terrier mix, a rescue will be your best bet. Purebred Australian Terriers don’t always find themselves in shelters, but mixes are a different story. Prefer a purebred Australian Terrier? Check out the AKC Marketplace to find Australian Terrier breeders in your area. Thoroughly research the breeder before planning a visit – are they reputable? Do they seem knowledgeable about the breed? Come prepared with questions about an Australian Terrier such as any health concerns or temperament issues. A great breeder will be able to answer any question you have. A reputable breeder will also have a clean home or kennel. Do the dogs and puppies shy away from the breeder? That’s a sign the breeder may mistreat their animals. Sometimes mistaken for a Cairn Terrier or Border Terrier, the Australian Terrier is quite different. They have an unmistakable shaggy coat that comes in three colors: blue and tan, red, and sandy. They are just in between the Cairn Terrier and Border Terrier, weighing between 15-20 pounds and standing 10-11 inches tall. Australian Terriers live between 11-15 years. Australian Terriers have a weatherproof, double coat that repels dirt and mud – making is extremely easy to maintain. Australian Terrier grooming only requires a quick brushing about once per week. Keep the hair that grows near their eyes trimmed or it could irritate them. They only require a bath when necessary as shampoo can soften their harsh coat which essentially makes it ineffective. Too many baths can also cause dry and flaky skin. And, be sure to trim their nails regularly. Note: If you are serious about your Dog's health then get a copy of The Ultimate Guide to Dog Health. Your dog is gonna love you for it. Click the link to take a look. The terrier group is high energy and the Australian Terrier is no exception. They need regular exercises like daily walks, play sessions, or trips to the dog park. If an Australian Terrier doesn’t get enough exercise, they will become bored and destructive. Learn how exercise can help dogs with behavior problems. The pint-sized Australian Terrier loves life but loves his humans even more. Thanks to their terrier heritage, they love to chase everything that catches their eye and dig up anything they can get their paws on. 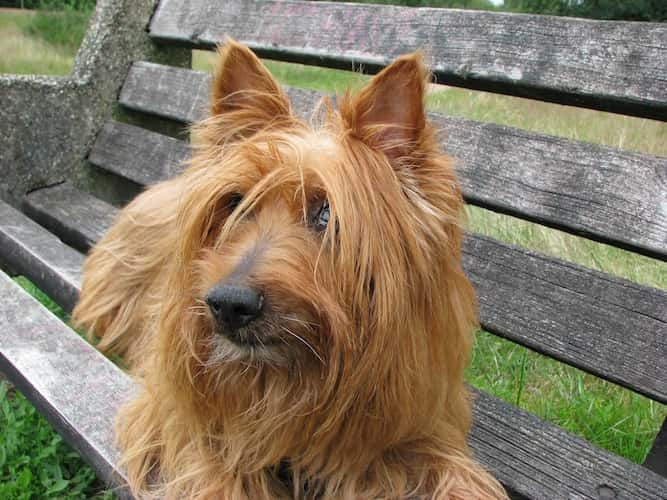 The Australian Terrier temperament is intelligent and this dog will respond well to positive reinforcement training. 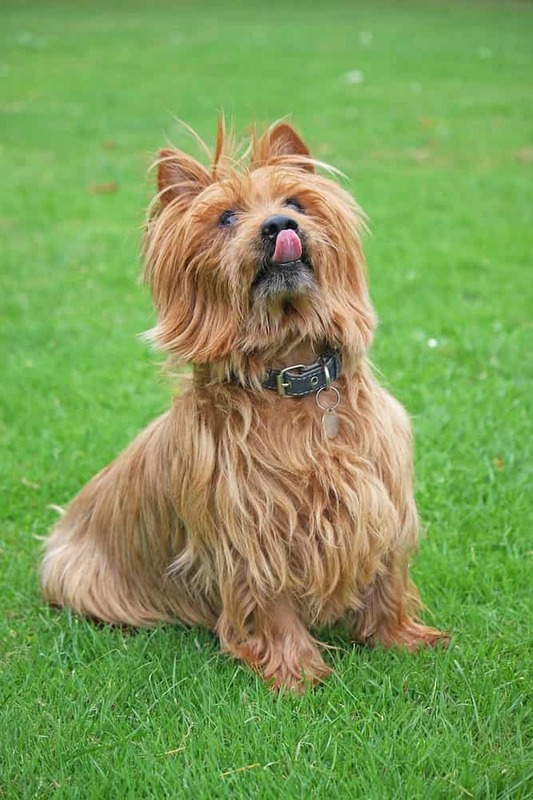 If you’re looking for a loyal and intuitive breed, the Australian Terrier is perfect for you. Next post: Miniature Bull Terrier Temperament (Fearless, Protective, Energetic): Can You Handle It?